Last night I decided to try out a couple of recipes from other people’s blogs. 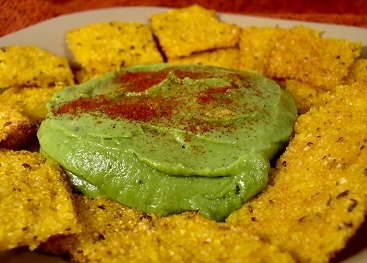 Fiber at 28 Cooks had a great-looking recipe for Polenta Crackers, and I was in need of something to serve with guacamole, so I decided to give her recipe a try. The only major change I made was to leave out the 2 tablespoons of margarine the recipe called for and add a tsp. of ground flaxseeds and two tablespoons of water–and for herbs, I used whole cumin seeds, chipotle chile powder, and garlic. My results weren’t as crispy as Fiber’s, though I’m not sure if that was because of the lack of margarine or because I didn’t spread the polenta out thin enough. Nevermind–even though they weren’t as crispy as they should have been, I still enjoyed these as a substitute for baked tortillas with guacamole. And I liked the little bursts of flavor the cumin seeds gave. In a large, oiled roasting pan combine the potatoes, cabbage, and butternut squash and toss with salt, pepper, and garlic. Add the whole tomatoes and their juice, breaking them apart with a spoon, and the white beans. Drizzle it all with balsamic vinegar, sprinkle with sage, and toss lightly. Place the pan in the pre-heated oven and roast the vegetables for an hour, stirring several times during cooking. Check the potatoes and squash for doneness; they should be fork tender. Continue to roast for another 10 minutes, or until the veggies are completely soft. 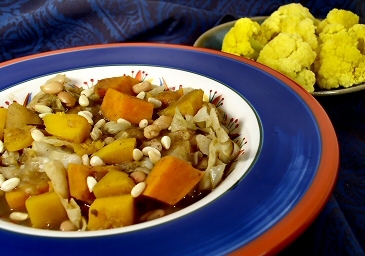 Serve in shallow plates sprinkled with pine nuts. This was an amazingly sweet dish. The butternut squash and sweet potatoes really bring out the sweetness of the cabbage. And the whole house smelled divine. Thanks, Karina, for a great recipe! This recipe is inspirational! My home smells awesome too!